Happy Tuesday friends! I hope you are all having a great week. I am excited today to bring you the most infamous dip in my house...easy sausage and cheese dip or affectionaely known as "Man Dip". I was shocked the other day when I realized that this recipe never made it to the blog. This dip has been around long before we had kids or moved into our current home which essentially means it's been a staple in our home for over 10 years. This dip is so easy and our family still asks for it at every birthday party of get together. So today I bring to you....MAN DIP! With only 3 ingredients, this is an insanely easy recipe to make. First, brown the sausage meat into small pieces. While browning the sausage meat, place the Velveeta cheese into a microwave safe glass bowl and pour the can of Rotel over top. Place bowl in microwave and melt on low heat for 8-10 minutes. I typically will stop the microwave every 2-3 minutes to stir the cheese/Rotel mixture. Once fully melted, set aside. 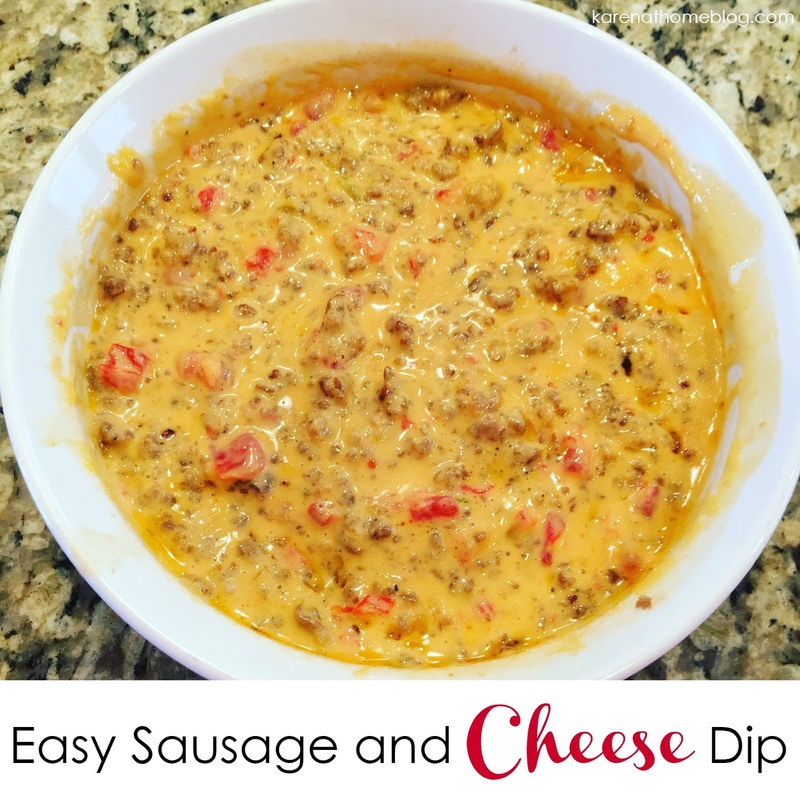 Combine sausage meat and melted cheese mixture and you are ready to go! I will typically keep the dip warm at parties by keeping it in a mini crock pot. Serve with tortilla chips. Enjoy! That dip looks so yummy!! Three ingredients? I could TOTALLY handle this and it looks amazing!! Definitely trying it!